#1 son picked me up early this morning and drove me to Thames to Liz’s place, as it was such a beautiful day we decided to leave as soon as we’d packed up the car, instead of in the morning. Much to my surprise we managed to fit everything in with room to spare, I could have bought more clothes with me after all, oh well I’ll just have to buy some! After one near disaster averted, Liz noticed the gas hob was still on just before we locked up, we made a quick trip to get the oil & water checked in the car and Liz realized she’d left her watch at home, luckily we were driving back past her place so she nipped in to pick it up and found that she’d left the garage door open!!! No, I said ‘don’t’ talk about away with the fairies! We finally made it out of there at 2.30pm heading for Awakino on the west coast about 4 hours drive away. We only had a couple of 5 min stops on the way as we wanted to be off the road before dark so there were no photography stops although I did take a few from inside the car. Hardly a cloud in the sky today, let’s hope it stays that way for the next 21 days. We drove through Morrinsville, Cambridge, Kihikihi, Otorohanga, Te Kuiti and on the way saw these wonderful rock formations. 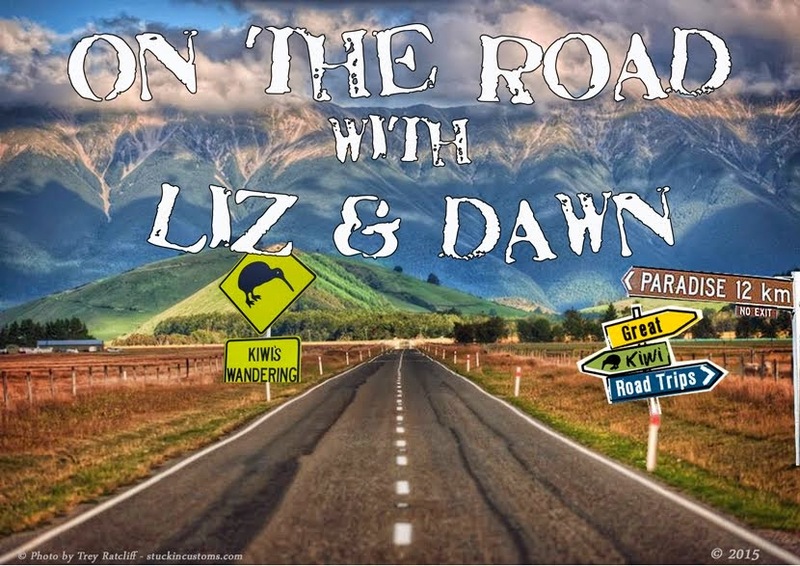 A kiwi slice of life in Otorohanga! We arrived at Awakino to find the only accommodation available was the local pub which we didn’t think was suitable for two young ladies of our standing so we gave that the thumbs down and were going to continue onto New Plymouth until we happened on a small camping ground right on a rugged west coast black sandy beach, it was just beautiful. The accommodation again wasn’t the best but this is an adventure right? So here it is, the Mokau Hilton…. Better known as the Seaview Holiday Park, with wonderful views to Mt Taranaki, and we were just in time to get a few shots of the setting sun and a quick walk along the beach. We had a quick bite to eat then settled down with a few wines and a game of scrabble and guess what, I won 304-195 – well I couldn’t miss the opportunity of taking advantage of a tired Liz after all that driving, could I? I wouldn’t let her go to bed! Maybe it will be a different story tomorrow night, we’ll see. Unfortunately no wifi here and we couldn’t even update Facebook from the cell phone although texting was fine. Will try to upload this tomorrow in New Plymouth. PS It’s a little bit nippy here and we haven’t even hit the South Island yet, did I bring enough winter clothes I’m wondering……great, could be an excuse for a bit of shopping…..
We wondered why we couldn’t find any light switches! Until we looked up….